Textile network will be introducing four vendors from the online shopping sector – from market-leading all-rounders to alternative and sustainable social shopping projects. What do these sites have to offer their users – and are they worth it from a business point of view? Part 1: Zalando. One of the most rapid developments in fashion sales has been the shift towards the online arena. It is hardly surprising, therefore, that the market for online shopping is highly competitive. Alongside brand shops, such as hm.com for example, it is mainly the sites that offer a range of brands and product types that are successful. In this way, they not only represent the product range of one shop, but of an entire high street – figuratively speaking, of course. Even though the market potential is still estimated to be extremely high, problems are looming. The logistics and high costs resulting from high return rates are leading to losses – many online shops are only able to survive the first few years on the back of large investments. Nevertheless, these new sales channels offer a plethora of service possibilities. Social shopping, for instance, is emerging as a strong trend. Since its beginnings as a shoe shop in a Berlin flat in 2008, Zalando has experienced rapid growth. With 13.7 million customers and a turnover of around EUR 1.75bn in 2013, the figures speak for themselves. Zalando employs 7,000 staff and, with the construction of a new logistics centre, is barely keeping up with rising demand. At present, Zalando operates in 14 European countries, with the majority of its revenue being generated in Germany, Austria and Switzerland. Its level of recognition among its target demographic stands at 95% in Germany. This, however, comes at a price, as the company&#146;s marketing budget for 2013 is estimated to have been around EUR 315m. But its image is crumbling. So far, Zalando has been operating at enormous losses – up to EUR 100m in 2013. Intensive support from investors such as the Samwer brothers and the Kinnevik Group are essential in keeping the business afloat. This in itself is not unusual in e-commerce. Other companies such as Amazon also had to bite for years before they were in the black. However, due to sinking growth rates in this sector, it is too early to say whether Zalando will share the same fortune as Amazon. In this light, Zalando&#146;s initial public offering in early October – the first step towards capital acquisition – must also be viewed critically. After the initial hype surrounding the shares, the price fell quickly and ended only slightly above the issue price. 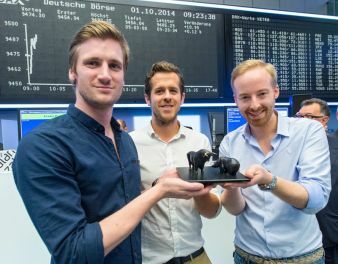 On the trading floor, Zalando is now worth around EUR 5.4bn. At the same time, ver.di– a major German trade union – is complaining of insufficient pay and the prohibition of works committees in the logistics sector. The site scores points for its high-quality web design and clear page layout. Using the classic search filters, customers can choose from 150,000 items including shoes, fashion, accessories and home textiles. Items are presented in a clear and aesthetically pleasing way. Like many online shops, Zalando offers free delivery and returns. One particular bonus are the ‘inspiration deals&#146;: bloggers present their favourite styles, and then the outfit can be purchased immediately from Zalando using its ‘shop-the-look&#146; function. A negative point is definitely the sheer number of items, which the search filters do not always know how to manage properly, sometimes leading to very time-consuming visits for the user.